Hi! My name is Karen and I just got back into chicken farming again last May (2008) after not having chickens for 9 years. 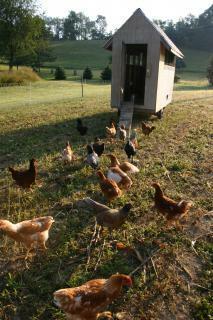 Bought some Americaunas, Rhode Island Reds and Golden Comet hens at our local feed store. Then my friend gave me an Americauna rooster. So we have 12 hens and a rooster. My sons have decided they want to show chickens and turkeys for 4H this summer so we ordered 28 S. Sussex, 15 Bronze turkeys, and I ordered 10 Rouen ducks for our pond. They will come in the next 2 weeks. Should be an interesting spring. June 2011: We gave up on the electric fence for now due to multiple problems and are using a dog kennel type run. We have 16 chickens now including: Americauna, Golden Comets, Speckled Sussex, Blue laced red wyandttes, black sumatras, 1 turkey and 12 mallard ducks. We just added a mix of 20 brown egg laying pullet chicks which include: speckled sussex, partridge rock, barred rock, cuckoo marans,one black australorp, wellsummers, and one silver laced wyandotte. We are battling a major raccoon problem this month.